One of my interests is finding efficient and useful ways to create, store, and retrieve information. I’ve tried tools ranging from wikis to to-do list managers to databases to Evernote to electronic notebooks to binders and paper notebooks, and while I continue to use a small fraction of those tools, still the grass is always greener on the other side, and I’m continually trying new ones. When I recently started my biggest project to date, though, I knew that success required tools that would work and that would keep working, and, to my surprise, I’ve found those tools. This isn’t to say that they have not changed and been added to and removed from and modified, but their core has remained, and the project has remained workable, useful, and interesting to me – unlike nearly every other system I’ve used for more than a few months (I’m coming up on a year and nine months now). Because it’s been such a success, I think there are some important lessons to be learned from the project, and I would like to share the general idea. When people talk about how to store and access information in the Information Age, the first and often most divisive question is whether it should be accessed through one or more computers or printed on sheets of dead tree. The debates inevitably come down to the same arguments over and over: Computers let you access information more efficiently, computers are the wave of the future, computers are faster to work with, computers let you back up your information. But then computers can crash, and paper is easier to read and work with, makes it easier to include information that’s more complicated than letters of the Latin alphabet, and doesn’t require you to have a charged battery. I’m sure you could supply a few more sound bites if you were called upon to do so. Nobody ever seems to win these arguments, although both sides are usually quite sure they’re right. The debate is often portrayed as a battle between the enlightened people who understand technology and will carry the torch into the future and the technophobes who stick to paper because they’re scared or ignorant of technology or don’t want to give up what they’re used to, who hang on desperately to the relics of a bygone age and have been seduced by some foolish notion of emotional attachment to having paper in their hands. If this is the narrative you’re used to, the answer you read on the website titled The Technical Geekery might surprise you. My answer, actually, is that we’ve built a false dichotomy for ourselves. There is no reason why a system needs to be limited to one medium, or why a system should be limited to one medium, except for lack of imagination, laziness, and the kind of technological elitism described above. At best, the people developing email systems, word processors, and databases implement a “print” function while looking down their noses at users who still want to take the antiquated and environmentally irresponsible action of printing out a document. So much more is possible! There is no reason why a system analogous to hypertext cannot be implemented on paper, except for the fact that almost nobody does it (the rare specimens of paper encyclopedias that remain being one of the few exceptions). There is no reason why we cannot have electronic searching and eBook copies of our printed documents, except for the way the book industry has developed. There is no reason why part of a system cannot be part on paper and part electronic (and I don’t mean that your book includes a CD-ROM containing ugly, buggy, and worthless software that works only on a specific type of computer and was thrown together at the last minute and shoved into the back of the book along with a prominent note on the front cover that you’re making a good purchase because it comes with a FREE CD!). And there is no reason why a combined system like this cannot exchange information in both directions as it develops. These ideas are what I’ve explored – to great success – in my project. There are two places where I write things in the Records Project, and I’ll look at each of them in turn. The first is called Random Thoughts, and it’s a document that’s been evolving since 2009. In this document I put quotations, anecdotes, ideas, and notes to myself; I add things if and when I feel like it. It’s kept in two text files on my computer; one is an archive and the other contains the current year’s notes. In order to be able to reference things in the document, the entries are numbered sequentially. Using some custom Linux Magic™, if I know I want to go to, say, entry 3456, I can call up the Random Thoughts window (which I always keep open on my laptop), type ;ta 3456, and the program figures out which file and what line that entry begins on and brings me there. The power of that system starts to become apparent when you consider that, after more than 4500 ideas that run through your mind enough to make worth recording, you start building off of ideas you’ve had previously and it’s nice to keep track of how they link together. If, when I’m writing a new entry or when I’m reading old ones, I’m reminded of something else, I do a search of the document to find the other entry, and I link them together by simply writing the number of each next to the other. Thereafter, if I’m reading one and want to see the other, I can position my cursor over the number and press Ctrl-] to go look at the other entry. (A section that you can skip over if you want, for those interested in the theory of linking: My links go both ways, a method known (creatively enough) as bidirectional linking. Most of us are used to unidirectional links because that’s what we have on the Web, but in many cases the connection is equally valid and interesting in both directions. The main reason many systems don’t use them is that it’s more difficult to maintain: you have to go place a link at the other end, and in a system like the World Wide Web, you probably don’t have permission to write a link onto somebody else’s web server. Since this is all my system, the only issue is the effort, and I’m committed to the better links it produces, so I write “BL” (for Backlink) and the source at every location I link to, even when this means going to the shelf and grabbing another notebook when it wouldn’t otherwise have been necessary. The paper-is-for-Luddites camp will point at me here and say, “Hah! But how do you find anything in your 2000 pages of paper notes?” Believe me, I thought about this before I started – and while I admit that I do not have full-text search and that that can sometimes be a liability, I can still find things remarkably well. The heart of the system is an index of each notebook, which I maintain in the front cover of each notebook as I write, adding to it after I finish each day’s entry. When I finish the notebook, I type all of the index entries into the Records Project Paper Augmentation System (RPPAS). The RPPAS is a custom software package that I wrote from scratch; here is where being highly computer-literate comes in handy. I took a long, hard look at how long it was going to take and other possibilities for handling the task, but found that there was no other software that even remotely resembled what I wanted. The RPPAS is still in development, but all the essential features that I need work. This system allows me to find most things in about thirty seconds of searching at the computer. The downside of indexing as opposed to the full-text search possible on a computer file is that I might neglect to add a certain keyword or have not thought about the relevance of that keyword to the text at the time when I wrote it, and I would then be unable to find it by searching that keyword in the index. Even on the occasions where this happens, information is rarely lost forever; I can often remember a related concept which is in the index and find it that way. It is foolish but common to assume that full-text search is intrinsically superior to paper-based search methods like indexing. Full-text search can be defeated as well; I recently couldn’t find the list of classes I intended to take next semester in my Random Thoughts document, even though I was certain that I’d written them in there. After manually paging through the document scanning for it, I found that I’d described them as “courses” rather than “classes,” causing the search to miss it. Full-text search, when used for large documents, also has an unfortunate tendency to find all sorts of things that are not actually relevant (unless you remember the exact wording that was used), forcing you to wade through piles of irrelevant information. Since index entries are assigned manually, they only get attached to things that you consider important, and you can use the same wording in the index for related pieces of information that don’t actually share a keyword in the text. At the end of my discussion of paper and computers, I alluded to the idea that my definition of a good paper-computer hybrid system includes exchange of information in both directions. I have three ways of doing this (besides the already-described searching mechanism). First, in addition to references within CBs and Random Thoughts, I use references between the two. Often I want to quote something I wrote in Random Thoughts in CB, or I want to allude to an event or experience from CB in something I write in Random Thoughts. So I simply write “RT 2412” in my CB or “CB20.56” (volume 20, page 56) in the Random Thoughts entry. If I want to look up the Random Thoughts entry, I go to the computer and type ;ta 2412 into my Random Thoughts window; if I want more information on the event, I can do some poking around in the RPPAS with that reference, or I can go to the closet and grab the notebook. There is really no disconnect between the electronic and paper components. Second, I scan all of my completed paper notebooks into the computer, thereby addressing another of the anti-paper objections, that I might lose the notebook, drop it into the water, or have my house burn down. The scans are high-quality enough that I could reprint them or use them as a substitute for the paper notebooks if necessary, although I’d still much rather have the originals. Finally, I occasionally print out a copy of the index, which I can use if I don’t have a computer handy and which will itself provide a backup to the computer version. (I do back up my files, but you never know for sure what might happen.) I’m a typography nerd, so I spent some time creating a feature that uses the LaTeX engine to create a nice, compact index (PDF, as an image at legible quality would be huge). I know there’s probably one more burning question for many readers: why go to all this bother? This might be a question of why I want to use the hybrid paper/computer system, or why I’m doing this project at all. These are valid questions, and I’ll take them in turn. Paper is a different medium than a computer. And because of this, I write differently on paper than I write on my computer. In particular, after many years of hard work and practice, I’m an extremely fast and natural typist (it’s a bad day that I type at less than 100 WPM in complete comfort). In my simple form of handwritten shorthand I can reach about 50WPM when I’m giving myself writer’s cramp while frantically scrawling scribbles that I might be able to read back in five minutes. Typing would mean that I could write more; for a while I kept a journal on the computer, and I think I did write more words than I do now. But for CBs I like writing slower, taking a few more minutes to reflect and really think about the words I’m writing instead of mashing them out on the keyboard. Call me weird, but I also like writing by hand, and it’s something I don’t get a lot of chances to do nowadays, so paper gives me that chance. As I said before, I tried keeping a journal on the computer for a while, and I was inconsistent with that because I didn’t enjoy it; it always felt like a chore. I wanted to have a record of what I was doing and my thoughts, but I didn’t want to write it, and that’s as much a recipe for failure as trying to become a professional musician when you can’t stand practicing your instrument. Writing by hand with my fountain pen and my notebooks and going through the ritual of numbering and indexing makes it less of a task. Occasionally writing does feel like a task in this system, but only rarely, usually when I have something on my mind and resent having to take the time to do anything else at all. That’s why the project has succeeded with paper, and why I don’t think it would have succeeded on the computer. It would also be a tremendous, unsearchable mess if I hadn’t developed the computerized indexing system and moved all of my random notes into the computerized Random Thoughts. This is why the combination is the solution. But why do it in the first place? There are plenty of reasons, but a couple stand out. I initially started the project because I wanted to improve my autobiographical memory, and that has certainly happened. I’m sure that it has also made me a better writer, even in the relatively short timespan of the project. I’ve written over 450,000 words in RT and CB combined, and even when I’m not trying to produce polished writing, writing that many words cannot help but improve your writing skills. And often I do look something up in the thesaurus or spend some time working out how to express a complex idea. Finally, it satisfies my desire to have a complicated, organized system of information that is truly useful, and I get to play with information systems while accomplishing something. Should you try something like this? It would be silly to say there is a right answer to this question. But a Random Thoughts–like document takes practically no effort and can be both lots of fun and extremely useful. All you have to do to start is create a new document in your word processor or text editor of choice and start typing whenever you have something you want to write down. That can be quotations, stories from your day, reminders about things you need to do, anything you want. Sure, there are tools that will make it easier to use (for instance, I have macros that will jump between files, find numbered references, and automatically insert the next unused number for a new entry), but you don’t need them to get started. My CB system is for the truly dedicated. I have not left out an entry for a single day so far, and I don’t intend to. Regardless of how picky you are about that, it takes time and deliberate effort to write something regularly, and most people will give up (including me, until I found this system). It also takes additional time and motivation to maintain the search system so that you can find things. I think it’s worth it, but everyone will not, and we would live in a boring world if everyone did. That said, I highly recommend a project of this kind (if at a lower level of commitment), even if you only try it for a couple of weeks and conclude it’s not for you. And trust me, it gets easier: once you’re past the first couple of months, it changes from being a difficult project you’re working on to something you just do. If you’re interested in the RPPAS software I described earlier, my code and a manual can be found on GitHub, licensed under the GNU General Public License. Have you ever been researching something and come across a website that looks like it’s exactly what you’re looking for, only to click the link and find that it doesn’t exist anymore? Unfortunately, the Internet changes quickly, and things as simple as reorganizing a site can completely invalidate any existing links — even if the information is still there! And, of course, it takes money and effort to keep websites running and well-maintained, so less-popular sites have a tendency to eventually disappear when their owners tire of them. Fortunately, this has been a problem for long enough that people have started to develop ways to get around it. Unfortunately, most of us still don’t know about them, and I find myself teaching people often enough that I thought I ought to write a brief article. I will present a couple of techniques, from simple to more complex. 1: Check the Google cache. This technique is useful if a site is experiencing temporary downtime, or if you click on a search result and find the page has moved to a different URL. When you search Google (or any other Web search engine), you’re not actually sending a request to every website that the content might be on. Instead, you’re searching an index of the contents of all the pages the search engine knows about. In addition to the indexed form, most search engines store copies of all the pages they’ve been to (usually excluding media to save space). Here’s the secret: you can access them too, and you can access them even if the original site is offline. On Google, there’s a teensy little down arrow next to the page’s URL (in green). If you click on that, there’s a “cached” option. (Google likes to move this option around, so if it’s not there, poke around and see if it’s somewhere nearby.) Bing has a similar little arrow; Yahoo is the sensible one and just has the word “cached” next to the URL. If the page won’t come up in a Google search or the version in the cache also gives a 404 error or doesn’t contain all the information you needed, though, you’ll have to try a different method. This is a very specific technique, but if you happen to want the contents of a page starting with http://geocities.com, know that Yahoo permanently deleted all the contents of this former free web hosting service. A lot of it was junk, yes, but there was also some very useful information on Geocities websites. Fortunately, the nice folks at Reocities copied a large portion of the content before it went down. You can try accessing it this way by simply changing the ‘g’ to an ‘r’ in the URL you’re trying to access. Even if the page you’re trying to access was not hosted on Geocities and has been down for years, there’s still hope. The Internet Archive’s “WayBackMachine” keeps permanent snapshots of over 390 billion pages (at latest count), so there’s a good chance that the one you’re looking for is there. Using it is straightforward: browse to http://archive.org and paste the URL you’re trying to access into the WayBackMachine box. (You have to remove the http:// first if you’re pasting.) You’ll then be prompted to select a snapshot date; the more popular the site, the more frequent the snapshots. You can start by selecting the latest one, but if that only contains an error page you can move back several until you find what you’re looking for. This is also handy if you want to view an old version of an article or manual, or if you just want to have fun seeing what the Google homepage looked like in the nineties. The archives aren’t perfect; sometimes a page or even a whole site will simply be missing, and there’s not really anything you can do about it. But very often it will let you view that missing page. Now you can be a little bit less frustrated next time you get the dreaded 404 error! Have you ever considered how many times we write words like “the” and “this”? Believe it or not, 25% of a typical English text is used by forms of just 10 words like these. When you stop to think about it, although these common words may be fairly short to begin with, they could be much shorter. Now, I’m not suggesting that I’d like to pick up some great literature, sit down in a comfy chair, and open my book to find many of the words compressed into little symbols so the typist could save some keystrokes. I like the English language as it is. But I also write a lot of notes, and I don’t care much about their aesthetic qualities. I just want to be able to write them efficiently and read them later. That’s where some simple shorthand comes in. The system I use is called Dutton Speedwords. (For the impatient, here’s my cheat sheet.) If you so desire, it can actually be used as a complete International Auxiliary Language, but those of us less ambitious can benefit greatly from a much shorter and more informal study. The only section you have to read to accomplish what I suggest in the title is “The First 10 Words.” But there’s a lot more to Speedwords, so I recommend checking out the rest if the first part interests you. It gets slightly more technical (but not difficult), so for those of you who are a little bit rusty on grammar terms, I’ve added links in possibly confusing places. [*] That’s a lowercase letter L.
[**] There’s of course nothing magical about the form of the ampersand common on the computer keyboard used here; any other form of the sign you prefer works too. [***] Obviously, English I and a are already one letter, but leaving them in their English forms causes them to collide with other Speedwords, since the system was not specifically designed with purely English in mind. In practice, these are not large problems; it is nearly always immediately clear which is being used from context. On rare occasions, they can impede comprehension until you notice the alternative interpretation. If you aren’t interested in continuing into more shorthand, you could certainly pick other letters for the colliding ones. And it’s totally fine to continue using the English versions on occasion as you get used to the system; as you get more familiar with it, you will probably start automatically using the “correct” Speedwords versions. General Note: There is no conjugation or declension in Speedwords; ‘e’ means both have and has and ‘j’ means both I and me. There are also no fixed parts of speech; a speedword can be used as a noun, verb, adjective, or adverb where it makes sense.There are tenses: prefixing the letter ‘y’ to a verb makes it past tense, and placing the separate word ‘r’ (will) before a verb makes it future (this is the same syntax as English). ‘y’ by itself is the past tense of ‘e’. And in all cases, if the tense is obvious from context, there is no need to specify it. If you stop learning right there and just work on using those 11 abbreviations over the next few days, you’ll already have improved your scribbling efficiency considerably. But if you like this idea, you can do quite a bit better with only a modest amount of time. If you learn the 90 remaining words in the top 100, you can double the percentage of words you can abbreviate to 50%, using mostly single and double and just a few triple letters. Actually, there are fewer than 90 to learn, because some of them are repeats, like we and us, which as you just learned above are written exactly the same in Speedwords.The top 100 English words can be represented with 80 Speedwords. For your learning pleasure, the list is available on my Dutton Speedwords Cheat Sheet. I will continue the frequency list here so you can get an idea of the language; this is not the best form to memorize from, though. I have made some modifications on the official Speedwords usage; I think the changes make the system better, at least for my purposes, but others might not, and I certainly don’t want to present this as an unaltered version, so I’ve noted the places where my usage differs from standard. There are also notes for features of the language that would be useful to learn, so have a look at them. [*1] In official Speedwords, this is used only as a question modifier, as in, “Do you have a pencil with you?” The word ‘fa’ is used for the sense to do something. I rarely observe this distinction and simply use the shorter form. In either case, it is not used or needed at all where it is used simply as syntactic glue: “No, I do not have a pencil” could be rendered as “N, j n h u pencil” (“no, I not have…”, or perhaps with technically correct but unusual English grammar, “no, I have not a pencil”). [*2] This could also be ‘shi’ depending on the context (‘-i’ makes a pronoun possessive). See “him” and “his book” versus “her” and “her book”: in English, there is no difference between the forms. It is of course not necessary for you to do this correctly if you are only writing notes for yourself, but you’ll probably get used to doing it correctly without trying once you start using the ‘i’ for other possessives. [*3] There are actual roots for many numbers, but I have not bothered to learn them, as the numerals do perfectly well. For one as an indefinite pronoun, as in “One should not stab oneself with a pencil, as doing so is quite painful,” use ‘eri’ (“something associated with ‘person'” – see Modifiers, below); sometimes I will write ‘-r’ instead (see note 4, below). [*4]This is part of an unofficial reform called “Speedwords Correlatives”; the original Speedwords uses irregular forms, but I use the following forms, dreamed up by Ron Hale-Evans, instead. A first part and second part are combined: ‘um’ = something, ‘jr’ = everyone, ‘jjz’ = any time. You can make compounds this way that are not single words in English; ‘kt’ = that amount, for instance. Also, even ones that do form words can be used in the sense of separate words: ‘ud’ = somehow, but also some way. I also use single parts occasionally (with the dash): ‘u-‘ = some, ‘-r’ = one. [*5] This is intended in the sense of “fair, right.” If you can’t tell from earlier notes, I’m not picky about the technical meanings of words as long as I understand them, so I often use it for other meanings of just as well. [*6] This is the plural of ‘er’, person. [*7] This is a German convention for ordinal numbers which I use: ‘1.’ = first, ’23.’ = twenty-third, etc. It’s faster than writing the little letters after the numeral. [*8] If In want to make it explicitly plural, I sometimes use ‘cz’. Doing so is not necessary for comprehension, though, if you try it. [*9] In the sense to look for, search. Similar words: ‘no’ = to look, notice, ‘vu’ = to see. [*10] Good and well are written the same. -z pluralizes: ‘er’, person, ‘erz’, people. Plurals may be omitted if there is a count or something else that clearly identifies them as plural: ‘erz go kp’ for people go there, but ‘4 er e kp’ for four people are there. -i makes a pronoun possessive: ‘g’, they, ‘gi’, their. More completely, it indicates “association,” or a particular similar word. You can also see this usage in this list with ‘idi’, like – ‘id’ means identical or the same. To make other things possessive, add a single apostrophe: Speedwords Soren’ = English Soren’s. -x or -o makes the opposite of something. (To make pronunciation easier, -o is used if the word ends in a consonant, and -x if it ends in a vowel.) You can see this usage several times in the list: ‘i’ = in, ‘ix’ = out; ‘nu’ = now, ‘nux’ = then. u- forms the present continuous or present participle: ‘j ko’ = I come, ‘j uko’ = I am coming. Sometimes I really do write extended passages of pure Speedwords. But when I do, it’s an accident: unless you’re specifically trying to remove your native language from the writing, you will of course find use for plenty of non-Speedwords complex words. When I write fast (which is obviously what you’re doing when writing in shorthand), I often miss perfectly good places to use abbreviations, too – extra credit for finding some that were on the lists and not used where possible in the following list. Once you’ve learned the words and grammar on this page (or better, from the list at the bottom), you should be able to read these actual sentences from my journal comfortably. I noticed qz j picked up ji phone at 8:13 k j yh u IT shift at 8. Eb though t e n l my-eloquent title, j yp n resist uma l pun. One advantage of having the shorthand symbols be ordinary letters of the alphabet is that you already know how to make the symbols, but another is that you can type just as easily as you can write. Personally, I rarely have reason to type shorthand, since I type at over 100 words per minute anyway, but others have found it very helpful. “I’ll accidentally expect someone else will be able to read a note written in Speedwords.” This has also happened a grand total of once. I realized my error approximately two seconds later, grabbed it back, and read it out loud to them. Dutton Reginald’s official dictionary, recently transcribed from a long-out-of-print paper copy, contains approximately 3,500 words and compounds that you can learn. At the very least, you can open it and punch Ctrl-Fif you notice you’re writing a word repeatedly and would like an equivalent for it, or on the rare occasion that you later read something you’ve written and don’t remember what the word means. In addition, it has a nice list of all the prefixes and suffixes and a few points of grammar that are absolutely worth learning if you want to continue beyond the word lists presented in this article.This old Geocities pageis a huge mess, but contains a few interesting things. Kafejo.com: A nice pronunciation guide (yes, this is supposed to be pronounceable – it might make it easier to learn and think about) and some other information about Speedwords. Because this post needed lots of diagrams, sections, and boxes, I did something unusual and hand-wrote it on graph paper and scanned it to a PDF. To continue reading, please click the link below. Beware: you’ll have to do some thinking! This is a really common and surprisingly difficult problem, though, so it’s worth trying to understand. It’s often useful to know how large something is. But most people don’t carry rulers or tape measures around with them, and most people are also bad at guesstimating lengths by looking at them (or, at least, they think they’re bad enough that they don’t try). People have tried to create apps with rulers, but they all suffer from the problem that they can’t measure beyond the small length of the screen. There’s one thing you can never leave home without, though, no matter how hard you try, and that’s your body. And once we’re finished growing, most of our body parts stay at pretty much the same size. People have measured by comparing the lengths of things to themselves for millennia, but nowadays if you go up to people on the street and ask them how long a fathom or cubit is, they’ll probably give you blank stares. Fortunately, it’s actually really easy to estimate distances using your body: just learn a few measurements and then add and subtract them for any distance you need. Below is a table of the measurements I remember. The Accepted Estimates are surprisingly accurate in most cases (although I don’t have one offhand for all these measures), but if you’re going to go to the trouble of remembering values, I figure you might as well do it right and measure yourself first. I use inches because I end up using them nearly exclusively in the United States unless I’m being precise or scientific or going for an exact value on something that was originally measured in meters, and in all those cases I’ll have a measuring tool. But if you prefer metric, this technique will work just as well with any system of measurement. You don’t need all these measurements to do a good job estimating. For most short distances, knowing the cubit, span, hand, and thumb values will probably be enough. However, the more you know, the easier it is to adapt to values that fall into inconvenient places. For instance, I added the short span to my list because it’s otherwise awkward to measure half a foot—my choices would be using a hand and two inches (nasty) or a span minus a ring finger (requires the item being measured to be mostly covered up). As another example, the two-fingers measurement is less accurate than the hand because I can stretch my fingers apart to a lesser or greater degree, but it’s a lot easier to measure the length of an object on a table that way than by holding it up to my hand. If you have a ruler and a tape measure, most of these values should be pretty easy to measure for yourself, with the exception of the fathom—it’s difficult to measure a distance without having room to move your arms in, and you have to stretch them all the way out. It’s probably easiest if you can grab someone else to help you, but you can do it by yourself too if you need to. Find a wall or long vertical space you can write on temporarily (this can be the hardest part!) and grab a pencil and tape measure, and mark or have someone else mark both ends of your fingers against the wall (don’t forget to get as flat up against the wall as you can—the error adds up with a five-to-six-foot measurement), then use the tape measure to measure between them. You can make this even easier if you can put one fingertip up against a shelf, doorframe, or perpendicular wall, so that you only have to make one mark. For the most part, your left and right hand and foot measurements will probably be basically the same, but you should still check both sides and note any differences, or just use one side. I have found two noticeable differences for myself: the line on the knuckle of my right thumb that marks one inch almost exactly isn’t present at all on my left hand, and my small span is a full inch longer on my left hand (I suspect it has to do with stretching to play the violin over years). I said your measurements should stay basically the same above, but as we age, our bodies do change, so if a few years have passed, it’s probably a good idea to crack out your tape measure again and make sure the numbers are still where you thought they were. Once you’ve measured and memorized a few values, grab a ruler and practice estimating and then measuring the size of some objects. You’ll probably be surprised how accurate you can be. This works especially well because many items are measured in neat multiples of inches; for instance, a standard photograph isn’t going to be 4.25 x 5.9 inches, so if it’s about the width of your hand and halfway between that and a span in length, you can safely assume it’s a 4×6 photograph. Also don’t forget that you have your height to work with (which nearly everybody already knows unless they’re currently growing rapidly). If you’re measuring vertically and an item is nearly your height, you can stick your hand on top of your head and measure from there. This week I made the decision to get a smartphone. I’m heading off for college at the end of the month, and I thought it would be nice to have a phone that I actually carried. You see, I previously had an iPod Touch and a flip phone, which was nice because the phone was cheap to own by modern-smartphone standards ($15/month) and the iPod did almost everything an iPhone does. The problem was that I used the phone so rarely I stopped carrying it around, which meant that it lost almost all of its value as a cell phone. Besides, I figured, it would probably be nice to be able to text sensibly in the modern world, and having a mobile data connection is pretty useful too. And my grandparents graciously volunteered to pay for the phone and the connection throughout my time in college (thanks! ), so there seemed little excuse not to go ahead. But I recognize that for someone like me, who wants to maintain control of my life and not be interrupted and distracted constantly, I’m playing with fire. It’s too easy to let a smartphone get out of control. At least with my previous setup, it was relatively impractical to be texting people constantly while also trying to work, or to start browsing the Web while hanging out with other people. That’s changed now; as much as people say the iPod Touch is an iPhone without the phone, it’s different to have an always-on connection, even if you nearly always have wifi anyway. So that’s why I’ve written up this little manifesto for myself. It doesn’t have to be right for you as well, but maybe you like some of the ideas in it. First and foremost, and really covering all the other points as well, no technology should ever be in control of me, whether a phone, a computer, or even a pencil and a piece of paper. I should remain in charge of my life and the way I choose to use my time. I find that there is almost nothing in the world, no matter what people would have me believe, that truly requires my attention immediately. It can wait for a few seconds, fifteen minutes, an hour, maybe even a couple of days. Just because my phone or computer decides to beep or buzz does not obligate me to respond to it. Nobody is going to be in danger if I don’t answer an email as soon as it comes in. I’ve turned off notifications on incoming email on both my computer and my mobile devices; I still check my email fairly frequently, but I do it when I deliberately decide I am going to go check my email, not because someone happened to send me an unimportant message at that moment. My phone should be similar. I believe there is no shame in using the “do not disturb” switch and ignoring other people for a while. If it’s truly an emergency, people can always ring me again immediately (which bypasses the function on my iPhone) or call someone else near me. Even if I decided not to be disturbed and it completely prevented someone from getting in touch with me in an emergency, it probably wouldn’t be the end of the world. After all, the person calling me has a phone, so they can always call someone else, or 911 if it’s really that bad. And before we had cell phones, the entire world dealt with being unable to reach each other at any moment for hundreds of years. Sure, sometimes it’s nice to be able to contact someone right away and get an answer to my question or get their help, but I believe what we’re giving up—our ability to concentrate and work undisturbed—is far more valuable in the long run. So if you call or text me, I might answer and I might not. If I don’t, I don’t hate you and I’m not ignoring you, and I will get back to you if you can have a moment’s patience. Text messages don’t self-destruct if they’re not read immediately, and there’s this handy thing called “voicemail” that lets people talk to me and tell me what they need even if I don’t answer, and I can call them back soon. Unfortunately, this is a hard thing to do in the modern world; people get upset when they call or text someone and they don’t answer right away. Because I’m trying to take charge of my own time and my right to refuse incoming messages until a better time comes, I will try to give other people more leeway here too. And even if I am annoyed at other people for not responding to me, it remains their right to do so (assuming they’re not being paid to answer people on time). It’s fine for my technology to be useful and to give me abilities I wouldn’t have otherwise. I couldn’t talk to anyone I know at any time I desired or access the entire world’s collective knowledge without a phone or computer. I even have an app called Chromatic Glass that helps me see distinctions between colors I can’t see without it (I have fairly bad red-green colorblindness). I refuse, however, to let a phone be the only way I can possibly accomplish a task, and I want to be prepared so that I will never feel utterly lost without it. I once overheard a student behind me on the bus complaining to his friend that he had lost his phone, and so now he couldn’t buy more drugs because his only record of his dealer’s contact information was in the phone he’d lost. Obviously he had larger problems than dependence on his phone, but it is important for me to consider what would happen were I suddenly forced to work without my phone. I keep as much of my data as possible synced to different places so I can still access it elsewhere if necessary, and I try to have alternate ways of accomplishing roughly the same things that I can with my phone. I don’t want to feel like I would be lost without my phone (or even my computer, which I rely on far more). Even if nothing ever happens, I don’t believe it can be good for me to put all my trust in my devices. When I don’t know what to do, I don’t want to just pick up my phone and start playing with it. Technology has a way of becoming the first thing people think about, and sometimes therefore the only thing we think about. That makes it more indispensable and more in control of us, rather than the other way around. It limits our ability to think for ourselves and our ability to simply sit and be bored. Personally, when I bought my iPod Touch I tried downloading some games, and I found I really didn’t like it. The feeling of sitting down and having nothing else to do and therefore pulling out my iPod and zoning out was just something I found deeply disturbing. That doesn’t mean it’s wrong for everyone, but it means I don’t have any plans to do it again. A mobile device being my default choice when I have nothing to do, to me, means I would never have time to think. For people that choose to use mobile devices in this way, I think it is important to decide deliberately to do so when in a given situation rather than to do it automatically. At first I thought I might write a list of attributes like in the preceding section here, but I hardly think it’s actually necessary. The difficult thing with a smartphone is not to envision possible uses or ways it could make your life better—there could hardly be anything easier (as evidenced by the hundreds of thousands of apps available for download at the touch of a button). You have a device with thousands of times the processing power of computers that only half a century ago took up an entire room, and it fits easily in your pocket. It has access to basically any information you could possibly want to look up. It can record the world around you and play it back on demand. It can listen to your voice and understand what you want it to do (well, sometimes). As Clarke’s Third Law says, “Any sufficiently advanced technology is indistinguishable from magic.” And it’s not hard to imagine what kind of mileage you could get out of magic. No, the real challenge is figuring out what you shouldn’t do with it. And basically, I think that can be summed up by saying you should remain at a certain distance from it. Remember that your phone is supposed to be a helpful tool for you to use how you wish; that’s why you’re paying good money for it, after all. Smartphones weren’t designed to tell you what to do and interrupt you when you want to be working. But it’s easy to let it happen. I don’t think I like computers very much. Maybe that sounds a bit odd. After all, I enjoy playing with and configuring new software, researching how parts of computers and software work, and writing software. I have a job supporting a computer software program. I’m going to major in computer science next fall. I read Slashdot and keep up with the latest trends and news in technology. I’m good at fixing things on computers. So I enjoy spending time on my computer. I like the things I can do with computers. But if there’s one thing I’ve become convinced of through all this time spent with computers, it’s this: computers never, ever work right. Maybe the software crashes and you have to restart your computer. Or your ISP stops providing Internet access to you and you miss an important deadline. Or somebody convinces you to click a link and suddenly your system is spewing spam at other people. Or you install a “stability update” and the program won’t start anymore. Or maybe your hard drive fails catastrophically and years’ worth of data disappears into the Great Bit Bucket in the Sky. When these things happen, I invariably get mad (once I’m past being scared if it smells of data loss), and I always get mad at the computer, even if the problem isn’t actually the computer’s fault. I don’t do this when other things don’t do what I expect. If I were to try to mail a letter and found that the outgoing mail box wouldn’t open, I would wonder why it wouldn’t open and maybe get a little bit annoyed that I walked out there and couldn’t mail my letter. I wouldn’t, however, be mad at the box itself, and I probably wouldn’t even be mad at the post office, since I wouldn’t know why the box wasn’t opening or whether it was the post office’s fault that it wasn’t. But if there’s a network issue and the computer won’t send my email, I get angry at the computer, without knowing or caring why it’s not working. Or if my house burned down and all my books were lost, it would really stink, but I wouldn’t get mad at the fire or at nature; at the most, perhaps I would get mad at the fire department for not putting it out faster, or at the person who installed the malfunctioning electrical system that caused the fire. If my computer won’t read my file, though, I get mad at the computer. I sit here writing my first draft at my desk, on a piece of loose-leaf college-ruled binder paper, with a refillable clear plastic rollerball pen that every few days I fill with green ink from a bottle on my desk. Occasionally the pen leaks ink into the cap. Sometimes it scratches while I write. Sometimes I have to pause to refill the pen or to wipe ink off the tip. Sometimes I get some ink on my fingers when I refill it. But I’ve never gotten upset at the pen when it acts up, even when its misbehavior is in no way my fault. I’ve never thrown the pen or slapped it with my hand or yelled at it angrily when it did something it wasn’t supposed to. But I’ve done all those things to my computer, and when I start typing this into my computer, if the keyboard drops my keystrokes or the computer freezes for ten seconds, I’ll at the least be making an annoyed noise. Why is the computer different? It obviously is. If my violin is difficult to tune up on a day when it’s really humid, it’s the weather’s fault; if my draft gets rained on and becomes unreadable, it’s my fault for leaving it outside when it was about to rain. It’s not the draft’s fault that it got wet because it was in the rain. But if a computer does even one thing we don’t expect, we always say it’s the computer’s fault – even when it’s evident that it was probably user error, like when we think we’ve clicked in the right place and the computer doesn’t respond until we click again. The pattern is clear: when most things don’t behave as we wish they would, we have several options: blame ourselves for doing something wrong (the draft in the rain), see the problem as a natural part of using that thing and try to find a way to work around it (the pen, the violin), or, when the situation is particularly bad or unusual (the fire, the mailbox), look for the cause and complain loudly about that. But when the computer doesn’t work right, we stop seeking causes right at the computer and get upset at it. We say “The computer hates me,” or “The computer is acting up again.” It’s the computer’s fault – nobody and nothing else’s. But really, none of the problems are the computer’s fault – the computer as an entity is only a bunch of electronics that execute directions. The problem could be caused by a blip in the electrical current that powers the computer, or by a bug in one of the millions of lines of code that tell it what to do, or by a button the user pressed at the wrong time, or by countless other small differences that are enough to set something off in the amazingly complex system that powers a modern computer. It could possibly be caused by a part of the computer’s hardware malfunctioning, but this is not what we are actually thinking about and directing our anger towards when we get angry at “the computer.” The issue is that these things that actually cause computer problems are not concrete, not evident to us as users; we cannot note the fact that our computers have frozen momentarily and immediately blame the person who wrote line 918 of dosomething.c in Google Chrome, or the person who turned on her air conditioner fifty miles away and caused a momentary change in the power supplied to the computer. So we blame what we do see: the computer. What we can see of the computer is no different than the fire that destroys a house – it’s merely an agent that carries out the instructions or the damage incited by another process – but looking at the fire, it’s easy to see that the fire does nothing for itself, that it arises from external forces it doesn’t control. We understand that the flames themselves are in no way responsible for their own existence in a way we don’t seem to understand that a computer is not responsible for the processes it runs. We understand that the computer is not responsible on a logical level, if we pause to think about it, but we don’t understand it on an intuitive level, which is where we get angry at our computers. So I am led to dislike computers: they are simply too easy to blame when they don’t work right. I only tolerate them because of what they can do for me. I will try to be more patient with them, but it sure isn’t easy. I got a call from “Windows” the other day. My computer, you see, had reported errors to Windows, and they wanted to help me get rid of them. First of all, let me point out a couple of essential problems with this scam. For one, “Windows” is not a legitimate company; Windows is a piece of software. Windows calling me to tell about a problem with my computer is like “Beetle” calling me to tell me about a problem with my Volkswagen. They didn’t say that their call was about Windows (which would have been correct, to a point), they said that they were Windows. Secondly, should I have accepted that Windows was a legitimate company, why would Windows have known that my computer had errors? They addressed this by saying that my computer was “reporting” errors to them. But why? Even if Windows (or anyone else) had indeed set up a massive surveillance system to know how well my computer was working at any given time, why would they bother calling me to help me get rid of the errors? They would have no motivation to do so. I did not pay Windows to repair my computer or to protect it from viruses. If I’m like most people, I didn’t even choose to buy a copy of Windows, much less enter into an agreement with Windows to maintain the well-being of my computer – my computer just came with it installed. It costs a lot of money to call people and help them fix their computers when they not only didn’t do anything to deserve it but didn’t even ask for help. No, to anyone who pauses to think about it – even someone who is unfamiliar with computers, unfamiliar with this particular scam, and does not know that Windows is not a company – the premise simply makes no sense. Why would one of the world’s largest software companies make an unsolicited telephone call to help you? No, of course this is fraud on a massive scale. Evidently there are a number of operations like this, but, no matter what, their goal is to cheat you out of your money. The guy then proceeded to have me open the Windows Event Viewer and filter the display to show me all the errors. (Of course it’s quite common to get some type of “error” logged in the event logs, which store practically everything that happens on the computer, even errors that aren’t important enough to indicate to the user. One common “warning” indicates that Windows hasn’t been able to synchronize the clock for one day, perhaps because the computer was switched off at the time.) I wasn’t actually displaying the errors, though, because I wasn’t even running Windows on the computer. In order to sound believable, I just played dumb and repeated the guy’s instructions and said “okay” a lot. And, of course, I delayed things on purpose, since my goal was to waste some time. After I said that I saw all the errors, he told me, “It’s eating your computer, sir, day by day.” He then immediately told me to “open Internet Explorer” and browse to a website; apparently I had been compliant enough that he didn’t try to convince me further that there was something wrong. I chose to pretend I didn’t suspect anything and follow the next set of instructions. He had me go to the website of a legitimate remote-access software product, then told me to click on a link that wasn’t there. I told him it wasn’t there (and it legitimately wasn’t – I wasn’t even making it up). We spent the next five minutes repeatedly spelling and retyping the URL, even though I said the page matched the descriptions he was giving. When that didn’t work, he transferred me to another guy who had me try the same thing again, then transferred me again to someone who had me try a different piece of software. The attempt to use this second piece of software gave rise to a farce where my computer displayed a thirteen-digit passcode and I was supposed to read it to him. (Before doing so, I unchecked the box that read “Grant Full Control” and put my finger near the power switch in case they connected and could actually do something on the computer.) I read it wrong, several times, then read it right. But it didn’t end there: I had to read it loudly and clearly at least ten more times (correctly) before the guy heard it right. At this point I pulled up several terminal windows full-screen and typed “cat /dev/urandom” in each, causing the screens to fill with random scrolling characters, which I suspected would confuse whoever connected. He never actually managed to get the software to work, though, even after he finally read the passcode back to me correctly. I was transferred again and told we would try “one more thing.” “We” went to yet another website and tried yet another software package. This time it downloaded correctly, but it was a Windows executable and wouldn’t have run on my machine. I said something like, “Uh, weird things are happening,” then power cycled the machine and said, “Oh, my computer rebooted by itself.” He sounded somewhat flustered, but bought it and sat waiting for my system to reboot. Throughout all the people I was transferred to, I was asked several times how old my computer was. I responded “a couple of years,” and was met with “okay”s and “huh”s every time. I don’t know what the point was; if I had been thinking faster, I might have given several different responses to try to find out (assuming they wouldn’t be recording the response). I’m not sure what I was planning to do next, but I think I probably would have “caught on” and tried a bunch of objections to see how much it would take to get them off the phone, but unfortunately I didn’t get a chance to do that, because the machine legitimately wouldn’t boot: my punching of the power switch had, by some fluke of improbability, corrupted the hard disk to the point where it wouldn’t start. After it became clear that retrying wasn’t going to do the trick, I hung up on him, somewhat disappointed but still amazed that I had managed to keep them on the phone for 32 minutes while not even having a Windows computer in front of me. After about thirty seconds, they called back four times consecutively: I would let the phone ring for a moment, press “talk,” then immediately press “end” and hang up the phone to terminate the call, and seconds later the phone would ring again. Finally I said, “Listen, I can’t talk right now, okay?” and hung up again as I heard someone saying, “Hello?” (Evidently the computer was dialing and then trying to connect me.) They haven’t called back since; I don’t know if they figured out I wasn’t going to talk to them anymore or just decided there was a problem with the phone. The hard drive was fine; I just had to boot off a diagnostic CD and run a disk check. I don’t know what they would have done if they’d managed to connect, but I suspect they would have tried to install some malware or some sort of backdoor, or perhaps purposefully broken the computer so that I would have had to pay them to fix it. This was a big operation. You could hear the call center noise in the background, and there were managers they went and talked to when something didn’t work correctly. The fact that such a relatively illogical scam can work is attributable to only one thing: people are scared about having their computers not work, and they’re scared of “viruses,” even though viruses as such are practically extinct in modern times. While the premise of the scam is ridiculous if you pause to consider, or at least odd enough to make you wonder what’s going on, the idea that your computer is going to stop working if you don’t let “Windows” (or “your IT department” or whatever) work with you is scary enough that enough people evidently play along and pay these guys enough money to make it a profitable scam. So, if you get a call from “Windows,” or an unsolicited call from anyone who claims they want to help you, think twice about what’s going on. If it sounds legitimate, hang up, look up the number on the actual company or organization’s website, and call them back and ask (while you’re on the Internet, you could also google it and see if it’s a known scam). Callbacks aren’t foolproof (really determined people can forward the legitimate phone line to theirs, for instance, or the number can be changed on the reference page where it’s listed), but if the scammers are just pulling a dragnet looking for the most gullible people, they’re not going to bother. Caller ID, while useful, is not a shortcut for this: it’s ridiculously easy to spoof caller ID, and nobody doing something illegal like this will display their actual phone number. And if you get a chance, turn around and mess with them a little bit. It probably won’t do anything significant, but it’s much more fun that way! If you get a good story, share it with me in the comments. Ars Technica also had an article about this or a similar scam some time ago. Most of us folks in the United States are familiar with the MM-DD-YY short date system (e.g., 6/28/13 for June 28, 2013). It’s familiar, but if you stop to think about it, it really doesn’t make very much sense. The digits of least significance are in the middle, not at the beginning or at the end. The only reason the order makes any sense at all is that it matches the way we say dates (May 23, 2013). In this article, I will explain the reasons the short date formats most people use are problematic, then introduce the alternative, YYYY-MM-DD format, and explain how it solves the problems of the other formats. Obviously that’s about as far from chronological order as you can get; the sort is essentially random, provided your list of dates uses all days equally. MM-DD-YY doesn’t handle this situation perfectly either, but at least it sorts the months in order, so it’s a little bit easier to find things. DD-MM-YY is indistinguishable from MM-DD-YY in many cases. By my calculation, this happens about 36% of the time (see why). If the day number is above 12, you can tell the difference if you’re paying attention, but if it’s below, you just have to guess which it is supposed to be based on the context. 12-11-09: could be December 11, 2009 or November 12, 2009This is not a small problem. This past year, a friend of mine thought a huge examination was going to be a full week after it actually was because the schedule was written in DD-MM-YY format and he assumed it was MM-DD-YY. With the four-digit year coming first, the system being used is clearly identified. (If you’re thinking sharp, you might notice that theoretically it could still be YYYY-DD-MM, but that would be a ridiculous system and I’ve never seen it used anywhere.) A four-digit year also avoids the Y2K problem when the dates are used in software. The system is big-endian, with the most significant part first. This makes the dates sort correctly with no special code or care on the part of the user. The parts are arranged in order of significance, so the order is more logical than that of MM/DD/YY. The system is an ISO standard (8601). If you like reading about standards on Wikipedia, you can do that here. Conforming to standards, when there’s no solid reason not to, is just a good idea (especially if you’re writing software or making official documents that involve dates) – everything is more likely to work out nicely in the long run. There are only two real issues with YYYY-MM-DD, and they’re both less serious than those of the alternative formats. The first is that some people aren’t familiar with it. This can be an issue, but it’s considerably easier to figure out the correct date written in YYYY-MM-DD format if you’re not familiar with it than one written in DD-MM-YY or MM-DD-YY when you’re used to the other order (and believe me, there are many Americans who have never heard of DD-MM-YY and are baffled when they run into it). The other is that while the mathematically most significant part is first, the year is often the part of the date that you care about the least, and you have to read through it before you can see the more important month and day. However, in the long term, this is turned right around and the year is far more important than the day or month, so overall I don’t think this is a particularly important consideration. I converted to using YYYY-MM-DD some time ago. I still use MM-DD-YY if I’m asked to write a date on a form or I’m afraid other people won’t be able to read it, but if I date something for myself I never use it anymore. You may not want to use YYYY-MM-DD for everyday things, but you should always use it in filenames, spreadsheets, or databases because of the sorting considerations – you’ll be thankful later if you need to sort the dates. You should always write leading zeros. For instance, January 1, 2001 is never 2001/1/1, it’s always 2001/01/01. Leading zeros help make sure computers sort correctly; even if you’re not planning to put the dates into a computer, it’s a good idea to do it now to make sure it isn’t forgotten if they ever are. 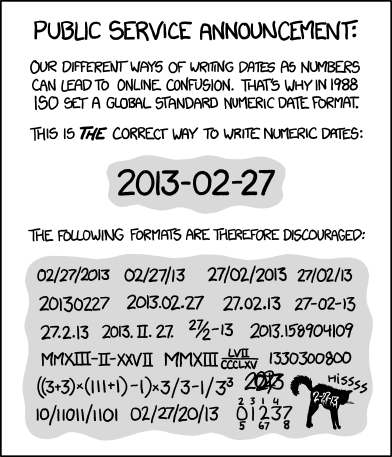 They also ensure the date has a consistent number of characters, which makes columns of dates line up much more nicely (yeah, I’m pretty picky about this kind of stuff). The ISO standard specifies a hyphen (-) as the separator. I personally tend to prefer the look of slashes (/), so even though it’s not the standard, I usually use them. Dots (.) also work well, especially if you’re naming folders or files (no filesystem that I know of accepts slashes in filenames). I always use hyphens if I write any computer code that involves dates, though – following the standard exactly is much more important there. Long story short, if you want to be certain your date is unambiguously- and ISO 8601-formatted, use hyphens, but if the date is just for you, I give you permission to use a separator you like better. One of the biggest advantage of electronic documents has always been that they’re easy to search. Good ol’ Ctrl-F has probably saved millions of hours since its invention. But what if you’d rather have something on paper, but you still need to be able to search it? I don’t have a keyboard and a little display in the front of my notebooks, but I do have an index, and in a large number of cases it works nearly as well. The index seems like a lost art nowadays with so many references moving online. Maybe that’s not so surprising: making a generally good index is quite difficult and historically has been a profession, and there’s actually an organization called the American Society of Indexers. But if you just want to help yourself find stuff when you put it away in your notebook or binder, it couldn’t be easier to start an index. In fact, you’re the best-qualified person to make an index for yourself, because you know how you relate ideas way better than anyone else. I’ve found a surprising lack of resources on the Web relating to this idea, so I’m writing my own. While I’ve designed this guide for notebooks because that’s how I use it, most of the techniques should apply to binders as well, or maybe even filing systems with a little bit of adaptation. A Topic Book index (ideas, thoughts). What got me interested in making my own indexes in the first place was an article by Lion Kimbro in the book Mindhacker, as previously mentioned way down in the middle of this article. He also wrote a book, How to Make a Complete Map of Every Thought You Think, which gave me a few more ideas. Many of the techniques are borrowed from one or both of these books, but I’ve added some of my own experience and provided a bit more description. My favorite idea from there, and one that I’ll repeat several times here, is this: “There are no binder police.” (I’ll say notebook for better consistency with this article.) It’s great to look at other people’s techniques and learn their rules. It’s also great to make up your own rules. Organization makes things more consistent and more useful. But sometimes stepping outside the lines is even better, and here, if you do, nobody is going to tell you you did something wrong. Don’t wonder whether you can draw an arrow in your index if I didn’t tell you to. Do it! Here’s a secret: if you like, you can even do something “wrong” just because you can. It feels pretty good sometimes. An index, as described in this article, is not a sequential list of the contents of your notebook. This article talks about the indexes the author uses, which consist of writing a page number next to the title of an entry with no particular order. While I don’t doubt this works for the author, personally I wouldn’t call it an index—it’s much more like a traditional book’s table of contents than an index. The problem with that approach, at least for me, is that, while it’s a little bit easier to create, you have to scan the entire thing to find what you’re looking for, which takes away a good part of the efficiency (and, frankly, the fun) of using an index in the first place. An index is not a list of titles. You want to extract words or concepts from your content and provide multiple ways to access it, because that’s the way your brain works. An index is not an exhaustive list of every possible word you might relate to a page in your notebook. Don’t hesitate to add useful keywords to the index, but only add ones you honestly think you might use to get back to that point. Finally, and most importantly, even after those rules, an index is not something that gets created only according to rules that are set in stone. Remember, there are no notebook police. If you want to write a note next to one of your entries, do it. If you want to flip the order of two entries, draw a big arrow on the page. If you want to add something that’s not even in this notebook, do it! This is both a boring topic and a boring task, but it’s a topic that cannot be avoided. If you don’t have any page numbers, you can’t have an index. Unless you’re really lucky, your notebook probably won’t come with page numbers in it, and if you’re using a binder and loose-leaf, it definitely won’t. If you’re going to use your notebook completely linearly, from front to back, you can get away with numbering pages as you use them. I personally prefer to go ahead and do it all at the beginning anyway even though it’s a boring job just because I’d rather not deal with it later, but you may feel differently. If you’re splitting the book into multiple sections or using some other organizational system, though, you’re going to have to bite the bullet and number every page at the beginning.You can get lazy if you like and only number every other page (either numbering with only odd numbers on the right side or using every number and using .5’s for the left side). However, if you’re picky like me, you’ll probably want to number all of them. If you do go for numbering all of them, number all the right-hand or left-hand pages first, then go back and do the others—it’s much faster since you don’t have to move your writing hand back and forth. Update 2013/06/28: There’s one other option, sometimes called the “quadrant method.” See the appropriately named section on this Moleskine/GTD fan page. In any case, make sure you’re turning the pages carefully so you don’t skip any accidentally. If you do miss a page, that’s not the end of the world either—the notebook police aren’t going to fine you for being clumsy. Just number the pages in between with decimals or fractions (I have at least one notebook that goes 86 – 86⅓ – 86⅔ – 87). And if you accidentally skip a number, you’ll just be missing a page number—it doesn’t matter. If you’re picky and paranoid about screwing up the numbering, you can do 20–50 pages on one side, then go backwards doing the facing pages, checking your work as you go along. That way you’ll catch it easier and have fewer pages to correct if you decide to change them. You can put your page numbers anywhere on the page you like. Personally, I’ve gotten used to using the outside bottom corners, but there is not even a guideline for this, much less a rule. If you’re using a binder, you have the ability to add pages in the middle of already existing pages. You can do whatever you like for numbering added pages, but I recommend using decimals between the existing pages. So if you insert a sheet between page 24 and page 25, number the front side 24.3 and the back 24.7. If you later add something between 24.7 and 25, number it 24.8 and 24.9, and so on. If you prefer integers, you can start by numbering by tens (if you’re old and geeky enough to remember programming in BASIC, you’ll be familiar with this technique). With a binder, you can’t number only one side of the pages, because if you insert a page in the middle later, one of the pages will suddenly have a different (implied) number. However, if you trust yourself to remember to add the missing number every time you add a page in the middle, you might be able to get away with it. Your index should go at one end of the notebook. Most books have an index in the back, but feel free to put it at the front if you prefer—that’s what I usually do. Don’t put it in the middle, though, because the very front and very back pages are by far the easiest to find. Then write big letters along the left side of the page (preferably in a different color than you intend to write in the index with). Some letters need more space than others. In a 240-page ruled notebook with 30 lines, I use five or six as a baseline number and add, subtract, or combine letters as needed. C usually takes up more space than any other letter. Give it at least one-third more space than a baseline amount. I takes up somewhat less space than average. J and K can be combined effectively into JK, using an average amount of space together. N and O can be combined into NO, using an average amount of space together. Q needs almost no space, as one would expect. I prefer to not combine it with either P or R, since they are average space-users, but rather to write it on its own, giving it only one or two lines. S needs more space than average. U and V can be combined into UV and still use slightly less space than average. W takes the most space of any of the end-of-the-alphabet letters, but can still use slightly less than average. You can plan out the letter distribution ahead of time if you like: multiply the number of lines per page by the number of pages, divide it by the number of entries (you can do 26 if you like, but as shown above, you probably want to combine some of them), then add and subtract from each letter to adjust the distribution, making sure the total number always remains the same. The one catch with this system is that you probably don’t want to split a letter over multiple pages, so you have to deal with also grouping the letters into sets of the number of lines on a page as well. are not the title of the page (we’re not going for a list of contents). do not apply to very many other notes (a keyword that has 15 page numbers is annoying since you have to look up many of them). are things you would think of when trying to find these notes (that seems obvious, but sometimes I find myself putting keywords in the index that are related to the notes but I couldn’t possibly expect myself to use when looking something up). if in doubt, should be the first things you think of, because those are probably the same keywords you’ll think of when you’re looking for it again. You can take a look at my example indexes for some ideas for keywords. If you don’t understand what one is, that’s good—it means it’s personal. I prefer to write names as Lastname, Firstname, but sometimes I have to skip out of this pattern when I don’t know somebody’s last name. If I’m afraid I might forget someone’s last name, I’ll often enter it in my standard format, then add an entry “Firstname, see Lastname”. In the end, it doesn’t really matter how you prefer to do it as long as you’re relatively consistent. Try to roughly alphabetize the entries within each letter. It doesn’t have to be perfect, and it won’t be, since you can’t predict what entries you’ll use next, but at least you can have items whose second letter is a at the beginning and ones with u‘s near the end. I’m still working on learning second-letter distributions for different letters; for instance, nearly half of words that start with c start with co, and most of those start with com or con. But don’t worry about these minutiae at the beginning, just try to get the entries roughly in order. I start with two columns, the first roughly A-L and the second M-Z; if one of them fills up and you still need to add more to the letters in that column, you can squeeze some entries in between, use some of the space from an adjacent letter, or put the entry somewhere else where there’s space and draw a line to the place where it should go. I’ve done this several times in the first example index. A final note here: be careful with the index pages! One of my notebooks recently split apart at the first page because I turn to that page so much and probably don’t do it too carefully (you can sort of see the damage in the final example). If you’re using loose-leaf paper, put those little reinforcement stickers around the holes (if you don’t have any, you can imitate them by taping over the holes on both sides and then re-punching the paper through the tape). If you’re using a notebook, be gentle when you turn to the index so you don’t rip the index pages out or wear through the binding. It’s frustrating to have a nicely designed and maintained index, flip to the index, and be unable to find what you were looking for. It’s even more frustrating to do this twice. So if you can’t find something, don’t just page through the notebook and find it and then continue on your merry way. Find the place, but then add it to the index under all the keywords you tried to find it under. That way, next time, you won’t have to do the same thing.Similarly, if you do find something in the index but only after you’ve thought of several different keywords, add the ones you were originally thinking of. And if you’re reading some notes and suddenly think of a brilliant keyword you didn’t think of before, go ahead and add it (just be prepared to find that you have, in fact, already written that one in the index—it will happen). If you’ve never made an index before, don’t worry about these things now. But if you’re looking for more, here are some other advanced ideas that I’ve found useful. TB (Topic Book) – Ideas, things that don’t really go anywhere else. CB (Chrono Book) – More conventionally known as a journal, but “journal book” sounds really dumb. DB (Dream Book) – What it sounds like. PB (Pocket Book) – A little tiny green notebook that I squeeze random ideas into and then put somewhere else. QB (Quote Book) – Another pocket-sized notebook with quotes from stuff I’m reading. Each set has a volume number, and every volume has page numbers, so I can write, for example, TB1.53. This reference is easy to write inline in other notes or in an index. Someday I’m hoping to make an index that covers many notebooks, but right now I don’t have enough notes to make it necessary or worthwhile. Sometimes it might be easier or more useful to index by a numbering system other than pages. For instance, in my dream journal, I number each entry and use that for my index. It may be less precise, since one entry can span multiple pages, but it’s more useful for finding what happened where. You don’t need to adapt your index in any special way, you just have to remember that the numbers aren’t page numbers. If you don’t number the pages, that won’t be hard to remember, but if you’re picky like me (are you seeing a pattern yet?) you might want to number the pages anyway and include a table of contents in the back that maps your internal numbering system to pages, or use the pages for some other thing. It’s useful to add a second set of page numbers at the other end of the page (top if you numbered pages at the bottom, or bottom if you numbered pages at the top, or either if you didn’t number pages at all, or on the side if you like to break the rules, or on the back of the page if you’re just weird) that match the internal numbering, in a way similar to the guide words in a dictionary. Thus if you find that you want to look up #459, you can just flip through the book at that corner until you see the number 459. In my Topic Books, I have a separate section at the back for quick notes. Some of these later get made into full pages or sections, some of them don’t. In any case, I like to index them. The information density is so high, however, that it’s not useful to give the number of the page—there could be twenty completely different ideas on the same page. So I number these ideas separately. Page numbers then get written in black next to keywords in the index, and quick note numbers get written in blue. If you don’t have multiple colors, you can put page numbers for one of the systems in parentheses, or precede them with a B or a smiley-face, or whatever you fancy. This isn’t really a technique, but it can be fun all the same. If I look at the index of one of my journals, I can instantly remember a bunch of the stuff that happened during that time just from reading the entries—indexes actually serve as a decent summary. The Index Game, then, is to look at an index (preferably one you haven’t used in a moderate amount of time) and try to see how much you can remember about the notes that correspond to each entry without turning to that page. For every one you succeed on, you’ll probably strike out on several more, but it’s amazing how much you can remember about some of them even when they’re extremely random. One trick is to look at the page number, then scan the rest of the index for other items with the same page number or a nearby one; hopefully another one will help you remember.